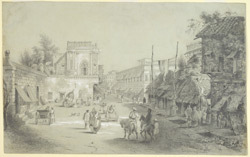 Pencil drawing heightened with white on tinted paper of Clive Street in Calcutta by Sir Charles D'Oyly (1781-1845) dated 1840. Inscribed: 'Part of the City of Calcutta. Sir Charles D'Oyly ad natm delt. 1840' and on the original mount: 'Part of the Old City of Calcutta by Sir Chas D'Oyly Bt.' This appears to be the original drawing for 'View in Clive Street' in D'Oyly's 'Views of Calcutta and Environs' published in London in 1848, although there are significant differences in the composition. Clive Street, now Netaji Subhash Road, runs north from the north-west corner of Tank Square, later Dalhousie Square and now BBD Bagh. Clive street is part of the longstanding commercial district of Calcutta. It is thought that Robert Clive (1725-1774) who ended the seige on the Old Fort in 1757 lived here. D'Oyly arrived in Calcutta in 1798 and remained in the city, with the exception of six years, until 1838.